Another Sunday dinner! We splurged quite a bit yesterday at a potluck and then a little bit more at the movies (hello, hot buttered popcorn and Reese’s Pieces!) So the goal tonight was to make a tasty, but healthful dinner. It was a total bonus that the meal was also easy to put together with ingredients I already had in the fridge and pantry – the only thing I had to grab from the store was the chicken. This is also a dish that is easily customizable – swap out the almonds, thyme, and oregano for any nuts and herbs you already have on hand. And I don’t have to tell you that baking the chicken rather than frying it saves big on calories. You’ll be amazed at how crispy this chicken is on the outside, yet oh so moist on the inside. Enjoy! A delicious almond and panko-crusted chicken breast that goes great over my lemon-herb rice pilaf. 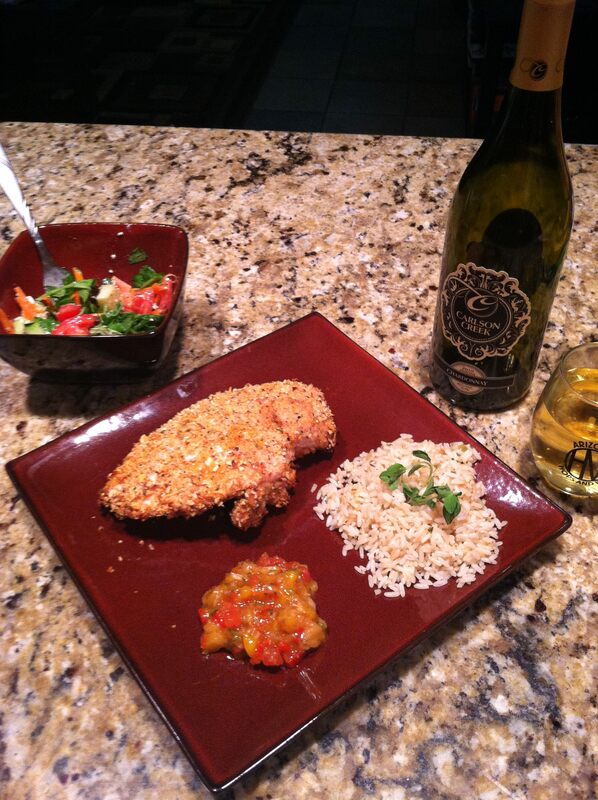 Serve alongside a nice chardonnay and you've got quite the date night meal! Toast the almonds in a dry pan over medium-low heat until golden and aromatic. Combine toasted almonds, breadcrumbs, thyme, oregano, salt, pepper, and chili powder in a miniature food processor and pulse until almonds are chopped and ingredients are combined. Put breadcrumb mixture in a shallow dish. In a separate shallow dish, whisk together milk, egg, salt, pepper, and Dijon mustard. Prepare a baking sheet by lining it with foil and placing a cooling rack in it; grease the rack with cooking spray. Coat each chicken breast first in the egg/ milk mixture and then in the almond/ breadcrumb mixture; place chicken breasts on the prepared rack. Lightly spray the tops of the chicken breasts with cooking spray. Bake until internal temperature reaches 165 degrees (which is about 20-25 minutes on each side depending on the breast size). Once the chicken is done, let rest for about 5 minutes. My chicken breasts were about ¾lb each and the total cooking time was 45 minutes. '3/4lb makes for a pretty large breast - Mike and I shared one and we have two remaining for leftovers.